Behind a late rally spearheaded by senior attack Ryan Hilburn, the Boston University men’s lacrosse team beat the United States Military Academy 8-7 Saturday afternoon. Fans packed the bleachers to see their seniors take Nickerson Field for the final time during the 2018 regular season as Terriers (6-6, 2-4 Patriot League), and would be treated to one of the most thrilling games of the season. Though the BU seniors would come out fired up, it would be the senior class of the Black Knights (5-5, 2-4 Patriot League) who would key an early run. The Black Knights got off to a fast start as senior attack Conor Glancy hammered home a smooth feed from sophomore attack Sean O’Brien just under a minute into the contest. After a long dry spell in which neither team could establish any offensive rhythm, Army senior midfielder Matthew Donovan parted the BU defense and snuck a bounce shot past Terrier sophomore goalkeeper Joe McSorley, giving the Black Knights a 2-0 lead. McSorley would recover as the quarter came to a close, stuffing a pair of attempts at the crease to stifle the Army attack. The Terriers’ goalkeeper did his part in keeping his squad within striking distance, finishing with a career-high 16 saves. The BU defense also stepped up in commanding fashion to protect McSorley, giving the Black Knights’ offense trouble throughout the game. BU struggled to break through a tough Black Knights defense led by junior defender Johnny Surdick, and did not record their first goal of the game until the 9:27 mark of the second quarter when junior attack James Burr scored off a feed from freshman attack Chris Gray. Glancy would answer once again shortly thereafter on the man up for his second tally of the game, and Army regained its two-goal advantage. Glancy finished the game leading the Black Knights with four points. While the first half was a war of attrition between the Black Knights and Terriers, the action would pick up in the second as both teams began to get into a groove. The Black Knights began the second half with a quick 2-0 run, and eventually stretched the score to 7-4 with 3:04 remaining in the third quarter. Burr answered for the Terriers with his third and fourth goals of the game, recording his fourth hat trick of the season. Burr currently leads the team with 31 goals on the season. 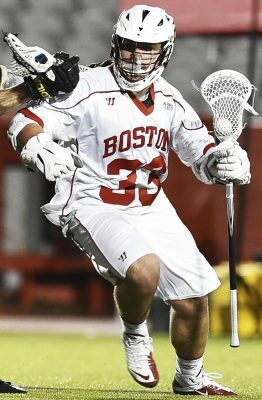 Following the game, Polley noted the adjustments his team made offensively in the second half to ignite the Terrier attack. After a hard fought man-up opportunity, Hilburn took a feed from Burr behind the net, and buried the game-tying shot with 3:36 remaining in the final quarter. Hilburn finished the job with 29.5 seconds left in regulation, putting the game on ice with a cold-blooded strike from the crease.